Blog Urban Trends Meet Rock n’ Roll! Urban Trends Meet Rock n’ Roll! The buzz of the 2012 movie hit “Rock of Ages” brought a surge of 80’s grunge rock requests to MKE. 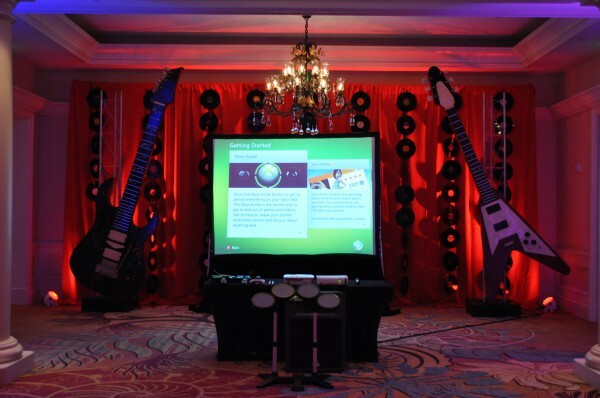 We were privileged to work with the amazing team at Advantage Destination & Meeting Services to execute this unique twist to the general Rock-n-Roll theme concept! Urban faux brick panels were used in a variety of photo op areas and backdrops throughout the prefunction area. 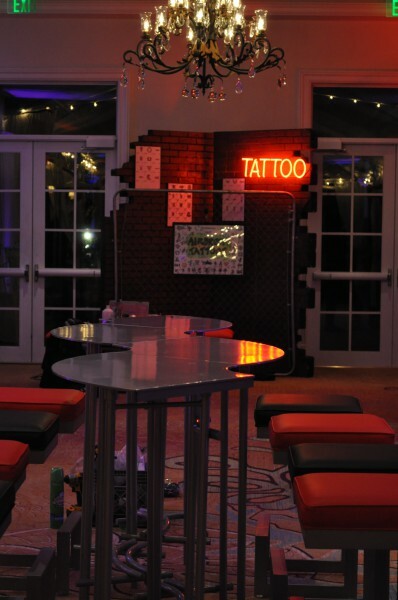 A real motorcycle set on a diamond plate overlay was complimented with a 12′ wide brick panel backdrop, while a replica “Tattoo Parlor” created a background to the “inked” interactive activity. 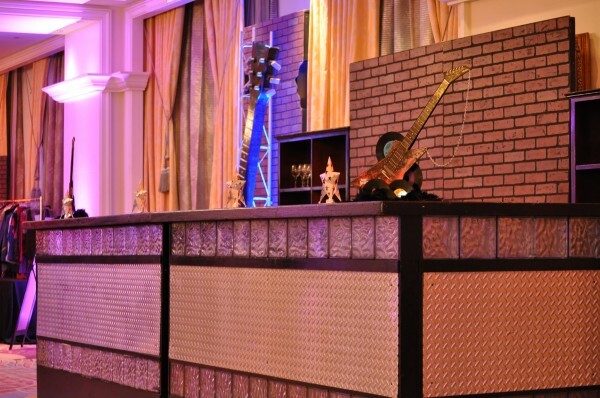 Our 12′ high guitars were accompanied with freeform brick wall panels to compliment the perimeter of the event space. 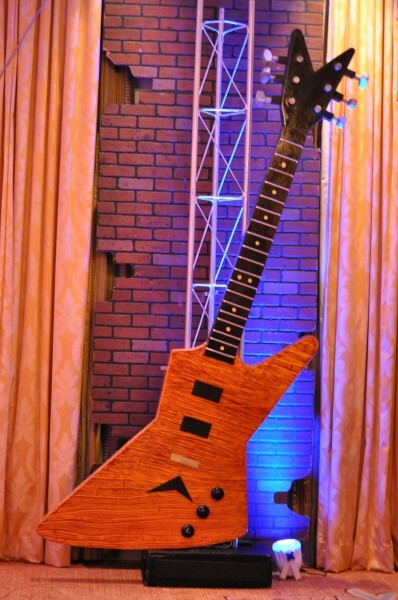 Our giant electric guitar replicas also became a part of the interactive Rock Band game simply by being assembled on either side of the center gaming screen! 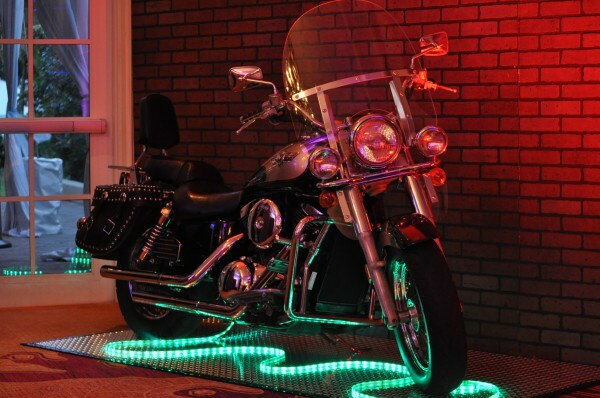 Our “heavy metal” glass block bar surrounds were paired with chrome step tread fascia to add to the rockin’ look! The textured brick panels served as the back bar backdrop to add to the unique beverage feature! 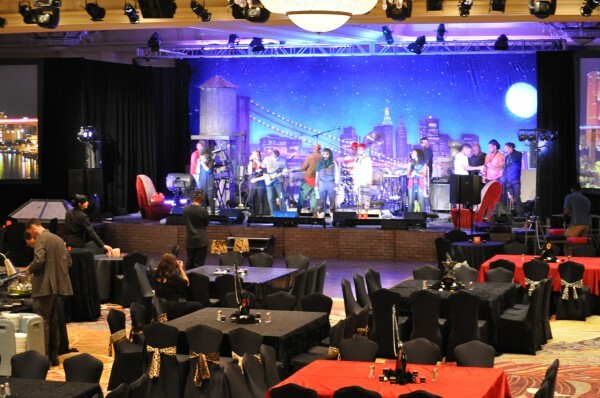 The “urban vibe” continued into the ballroom space, with the direct focus toward the “cityscape” stage set. MKE assembled a dimensional Rooftop Stage set, complete with faux chimneys, vintage-style water tower, angular brick roof-top “accesses” as a background, and even skylites, to pair with the client-provided skyline backdrop! 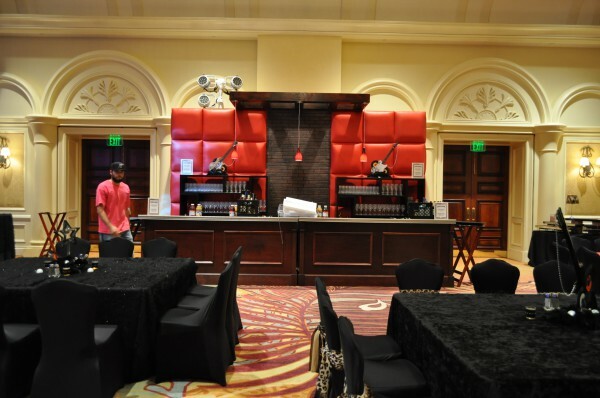 Newly conceptualized “Urban Trend” beverage vignettes were created using our mahogany bar surrounds paired with background combination of lush, red padded “pillow walls” and brick panels. Artfully designed red pendants hung overhead the bar front to lend a colorful glow over the entire set!